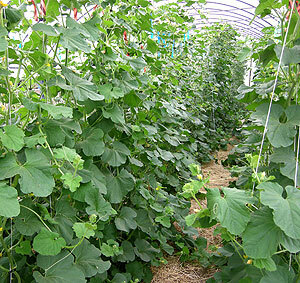 Melons and other trellised cucurbit crops make maximum use of the vertical space in high tunnels. Vining growth habitat maximizes the vertical space of a tunnel. Fast turn-around allows for multiple plantings per year, or relay cropping with cool season crops. Soil and bed preparation for vine crops is similar to other warm-season vegetables, usually using black plastic mulch to warm soil and drip irrigation to maintain even soil moisture. Some vine crops are intolerant of cool soils. For example English cucumbers should not be planted until soil temperatures are over 60º F. Although many vine crops can start from seed, transplanting maximizes the economic return of the high tunnel over time. Cucumbers come in several categories: Picklers, slicers and seedless. Premium prices for seedless varieties in some markets make it more likely that they will justify the extra labor and other expenses to grow them in high tunnels. Seedless cucumbers, also known as European or English cucumbers, do have small seeds. But they are easy to digest and thin-skinned. They are grown in greenhouses and tunnels throughout the world. Seedless cucumbers are divided into long (more than 8 inches) and ‘mini’ varieties (4 to 8 inches). Seedless varieties are easily trained to optimize the vertical space of the high tunnel and are very quick to yield. However they have several disadvantages when grown in high tunnels in New York. They are susceptible to many pests and diseases, face price competition from field-grown cukes and have high labor inputs. Unlike other vine crops, seedless cucumbers do not need pollination. Bees and other pollinators should be excluded from the tunnel, particularly for the longer varieties. 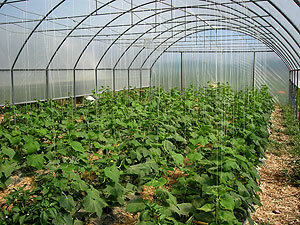 Field varieties of both slicers and picklers can be grown inside high tunnels as well. These crops need pollination. For early crops, you can put a commercial hive of bumblebees in the high tunnel to improve pollination. The prices received for field varieties are too low to justify the labor for vertical trellising, although many farmers do use panels or twine to give the cukes an opportunity for some vertical growth. This crop is not widely grown in New York high tunnels. Cornell research in 2008 found limitations in the return to labor input for vertical trellising of personal-sized watermelons. Future work may look at a non-trellised crop. Pest pressure can be severe. Cantaloupes seem to respond better to the tunnel environment than watermelons, based on our current work, as well as that of others. Timely chemical treatment of these pests can be difficult as their populations build rapidly. Safe and thorough chemical application in the enclosed tunnel environment is hard for the applicator. Biological control is an option if a program is started early.